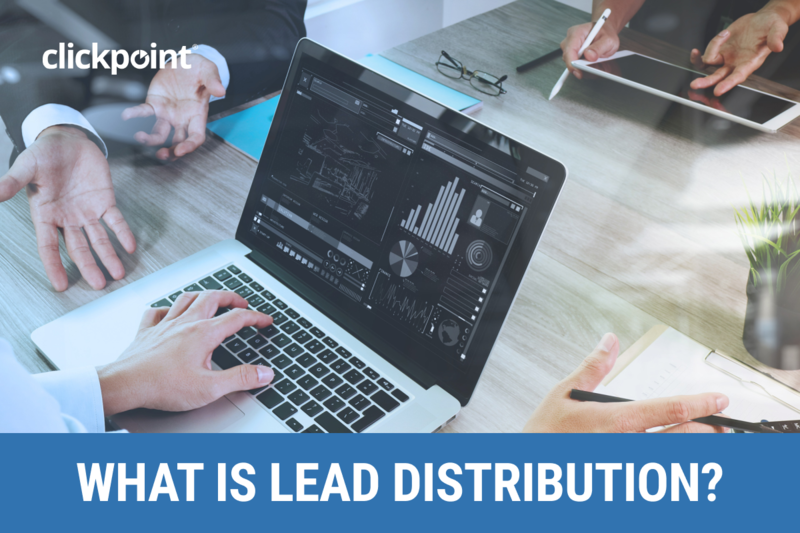 What is Lead Distribution? How to Implement a Lead Distribution Solution? Home > Blog > What is Lead Distribution? Lead Distribution is automating the delivery of digital leads to salespeople, lead buyers, or third party software solutions. Lead Distribution allows companies to quickly capture leads and then intelligently route them based on a variety of factors. I love this topic, because frankly it’s one that never gets old for me. Lead Distribution is the term that applies here, and it is what put ClickPoint on the map. Why does decentralized lead distribution matter? Yawn, I get it. You are bored already. Please read the next two paragraphs and I promise you won’t still want to kill me. Big companies with lots of leads have to move leads, phone calls, and data around to lots of different solutions in order to make everything work. Most large companies that collect a lot of leads need to be able to take leads in from a variety of sources and then they need to sort it, measure it, and then get it to their sales floor as fast as possible. In the past companies would use CRM software to accomplish this task. That might work for a company that has salespeople in a couple of locations but not companies with many branch locations, franchisees, call centers, and sales teams. It used to be that you could just require all salespeople to login to whatever CRM you chose for them. With so many software solutions available today and the need for companies to use best of breed, this is not practical. What happens if you’re a company that has 1,000 or more franchisees, all with different software solutions they are using to manage contacts and leads? What happens if you have call centers, internal sales, corporate branches, and franchisees? All of them could potentially have different software solutions. Adoption of your software sounds like a root canal to them. Think about the cost to convert them and what it would take to require them use your new CRM, never mind the backlash for making them use your chosen software over their preferred solution. There are so many thing to consider like, training, downtime, and maintenance that SaaS based software providers will take care of for you. Why bring on the added stress to your organization when you don’t have to? You are not alone, this is a pain point most corporations face, and CRM for all of its great accomplishments, is not built to distribute leads and play nicely with other solutions. CRM software is a centralized solution with no real way to integrate easily with other third party applications. Many have tried to Frankenstein a CRM solution and many have failed. So how do you accomplish this type of decentralized lead distribution? You have to be able to handle a lot of leads and distribute them in real-time to other solutions. You also have to ensure all of this lead data reaches its end destination. This lead data in order to be monetized needs to get there in a matter of seconds, not minutes, or hours. If this sounds like an insane list of requirements this is what most corporate clients need implement a lead generation program. Most lead distribution solutions are built to handle parts of this but very few combine everything into one solution. For a marketing executive thinking about implementing something like this seems daunting, and it can be. Implementation can take a month, to 6 months, or more depending on the amount of integration work that needs to be done. Is it worth it? Think about the costs associated with running an internal system and the head aches that come along with maintaining it. Likely, there is a team of developers that come and go and have been building on top of the existing system for years. If this sounds familiar it should, we hear stories like this all the time. We encounter it with every corporate team we meet that has an internal solution. It’s not a bad idea to build internally out of necessity but it should be avoided if there is a clear solution that prevents you from experiencing this kind of pain. You built an internal software solution because you had no other choice, we get it. You had no way to compare the cost to do it internally vs. an outside provider. Now that you know there are options available to you, go explore and step outside of your comfort zone. You might find that the best solution is easier to implement than you think. This entry was posted in Lead Generation System / Sales Software Best Practices and tagged CRM, CRM software, lead distribution, lead distribution software, Lead Distribution Solution, Lead Management on May 21, 2018 by Gabriel Buck.